The birth of these sweet little kids was anticipated for a very long time. As their mother struggled with prenatal surgeries and premature labor, the situation was not promising for her to bring home the 3 babies from the hospital. At 25 weeks gestation, Keirsten, Leah, and Grady made their entrance into the world with a great deal of medical intervention. They were in the hospital for months; one of them didn’t even weigh a pound at birth. After numerous scares, doctors’ appointments, and medical diagnosis, the triplets came home to their parents on monitors with cords going everywhere. The triplets progressed through milestone after milestone. Illness and surgeries came and left and they continued to flourish. Their mother worked hard with the guidance of the early intervention staff to keep them motivated and developing. When it came time to discuss leaving early intervention services and move on, none of them needed any more assistance. They now have gone through their kindergarten screening and will begin kindergarten in the fall with their peers. “We were fortunate that Lyra was diagnosed so early. She has had regular visits to her pediatric ophthalmologist since birth. At 3 months, her nystagmus, strabismus and photophobia were the primary issues. We were told she would eventually need strabismus surgery, but not how soon that might be. Dr. Grin said Lyra was beginning to show a little bit of farsightedness, but not enough to warrant glasses. More about Lyra can be found at ParentOfAChildWithAlbinism.com. Photo by Christina Sandberg, Sandberg Photography. My son was born at 26 weeks premature. I was told there was a 50/50 chance of survival. My heart was torn, and I was very afraid! The doctor on staff told my husband to expect blindness, deafness, and even retardation if he made it. We were crushed. After three very long months at the hospital, our son was released to go home. During our first month of us being at home with our son, tiny-k Foundation staff showed up on our doorstep. This included a vision specialist, physical therapist, occupational therapist, hearing specialist and speech pathologist. 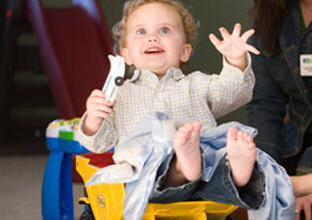 My son benefited from therapists coming to our home for the first year. 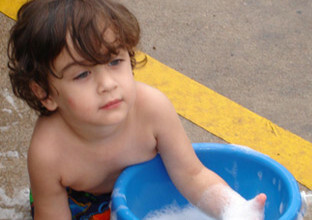 The following year he was entered into the two year old program at Uptown Kids. He was diagnosed with Autism Spectrum Disorder and some delays. His teachers, helped bring him out of his shell, and now he is more sociable with his classmates and family members. He can eat, walk, run and play on his own. 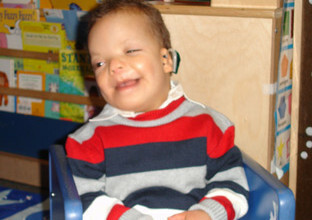 The tiny-k Foundation staff helped teach me to help my son with his current conditions. I cannot express enough gratitude for the help of the tiny-k program. I was so scared and weary. My child was a little over a month old when a Rainbows team that included a vision specialist, physical therapist, occupational therapist, hearing specialist and speech pathologist came to our little apartment. My son benefited from tiny-k services until he was a little over two years old and then transferred to the 3 – 5 year old services he is still getting today at the Rainbows’ Kids’ Cove center. My son has always eaten on his own (never needed a feeding tube). He sits, crawls, and can almost walk on his own. He has a sign language interpreter all day long and is learning how to sign and understand sign. He does more than any of the doctors ever dreamed he would do. Something staff always told me was to never think that your child is not able to do something. I can’t praise them enough! John used to lie on the floor, stare at the ceiling and hold on to his blanket every waking minute. On May 30, 2006 Paul and Marci were told that their precious son was diagnosed with autism at 17 months. Their dreams were shattered, their world turned upside down. They turned to tiny-k.
A tiny-k autism specialist now comes to their home and works with John and his family, including his older sister who is included in the therapy sessions. Marci has learned what she can do to engage John in activities, help him learn to speak and develop in a way that works for John. John is now a happy boy who is learning new things and helping his parents to dream again for the future. Thank you tiny-k.